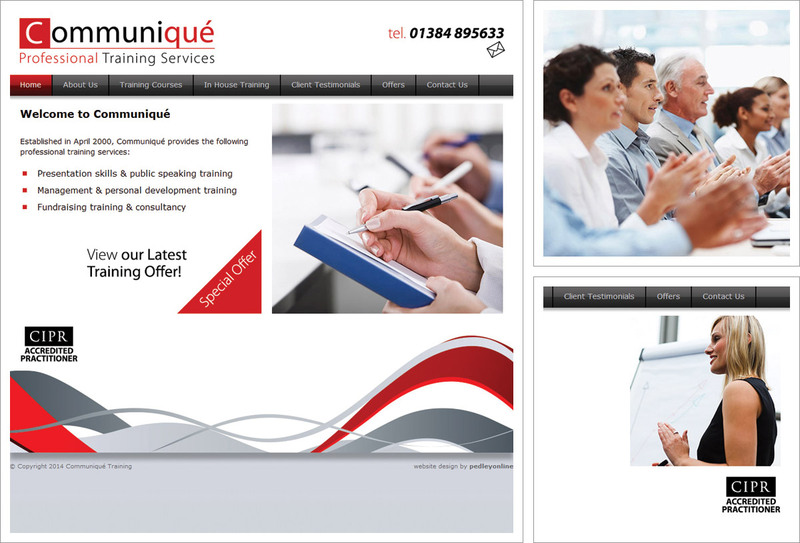 Communiqué Training provide professional training services to include topics such as Presentation Skills, Management and Personal Development and Fundraising Skills. Our brief was to create a fresh new dynamic logo for use on the website and other marketing materials. The website is completely expandable and can be updated by the customer themselves. It is built using WordPress. Following completion of the website we proceeded to work with Communiqué to produce complementary marketing materials such as branded letterheads and business cards. “Right from my very first meeting with Brian, I knew immediately that I’d made the right decision in choosing Pedleyonline to redesign my website. Brian took the time to understand my business and what I wanted to achieve and worked within an incredibly tight timescale to achieve it. There were lots of tweaks along the way, but nothing was too much trouble and I was delighted with the end result. I found Brian to be polite, approachable, enthusiastic and extremely professional. He also has the patience of a saint when dealing with those who are not technologically or IT minded! Pedleyonline was a real gem to find and I wouldn’t hesitate in recommending them”.